The theme of the book is to establish existence of mysterious link between the designs of European and American-mega cities such as re-built Paris, post-great fire London and specially-built Washington DC and the ancient cities of Luxor, Rome, Heliopolis, Alexandria and Karnak. The author, Robert Bauval, being a structural engineer, the book is developed as a delightful resource for architectural history of otherwise invisible Egyptian link beyond the obvious iconography. Could anyone imagine, deliberate use of very unchristian, very heathen, customs and rituals of ancient Egypt by Christian and secular countries of America and Europe at the key monuments in those cities? Why was it done? The book provide eye-opener episodes from dark pages of history when people of Europe faced brutal repressions from the Church and clergy. After the state protection provided in AD 312 by Constantine, there was no looking back. Corrupted by power, wealth and ambition, the Church inflicted unspeakable tortures for last almost 2000 years, resulting in deaths of over a million good people, thinkers, scientists, writers artists and pious missionaries. The book connects many 'heretics' and intellectuals, Cathars, Messalians, Bogomils, Templar Knights, Magis, Manicheans, Lutheran Protestants, Freemasons and intellectuals such as Voltaire, Rousseau, Francis Bacon, Cromwell, Giordano Bruno, Tommaso Campanella,George Washington, Benjamin Franklin, Roosevelt, Mitterrand, etc. Book can said to have begun at the Place de la Concorde in Paris where the author, Robert, was looking at the Egyptian obelisk and wondered to himself: “how strangely forlorn it (obelisk) looked, away from its original home at Luxor in Upper Egypt. It was, as far as I knew, the oldest monument in Paris, dating from the reign of Rameses II, c. 1260 BC. It was one of a pair, the other still standing outside the Luxor temple. I realized that I knew virtually nothing about why and how it was brought here to Paris.” One curiosity led him to many more. And ultimately over a period of many years of research, it yielded this book. Some reviewers think that the book is speculative and that the book does not contain anything 'new'. This could be a view of Church because they knew everything. They had skillfully kept many things away from public's gaze. However, from the references provided and the intensive research carried out by both authors, to me it is not as speculative as what those reviewers want us to believe, rather it has a lot of substance and it neatly concludes architectural links. While successfully establishing the existence of the invisible but continuous thread extending from the era that has gone by to the present, what authors have more significantly pointed towards is the continued existence, throughout the Christian history, till today, of those factions, groups and people who although dearly loved Jesus, would not like to accept writ of Church. For them Church was unholy, an 'imposter' and usurper of Jesus. For them, Pope was “devil's representative on earth”.More learned among these 'heretics' lived a frugal life, were celibates, ate strictly vegetarian diet and spent their time on God contemplation. They chose to live in voluntary poverty. And yet they and their relatives were hunted, tortured, burned, decapitated and all their worldly belongings confiscated. The Church had unleashed an era of 'informer culture', 'heresy-hunting', moral corruption, political power of Church and deadly inquisitions. That rebellious link however still persists, and still performs mysterious pagan rituals, if we are to believe the authors. Fortunately some of the documents that Church wanted destroyed had survived to see the light of the day. When the 'Nag Hammadi Library' was discovered in Egypt in 1945 and they give out clear message of the existence of 'secret society' as a resistance group. It is clear that Church erred, grossly erred, by their later date reinstating most of those who were punished and admitting Popes having committed excesses under 'pressure'. Authors have uncovered mystery behind the deliberate use of ancient religious rituals involving Sun, Osiris, Isis, Sirius, Pyramids and the use of elements from the temple of Solomon and in general a host of 'pagan' things from Hellenistic and Mesopotamia cultures. The canvass of the Authors is huge, it begins from prehistoric Pharaoh times and moves to Hermes, Moses, Plato, Aristotle, Alexander Ptolemy, Darius Julius Caesar, Charlemagne, French Kings, Napoleon, Nelson, British Royals, Ben Gurion, Franklin, George Washington and George Bush. It takes in its stride, major European events, Crusades against Islam, Crusades against Christian heresy-mongers and against free thinkers, academics and artists, Rise and fall of Knight Templars, Secretive society of Freemasons, Illuminaty, Rise of Lutheran Protestantism, French revolution, American independence, creation of Israel and 9/11. It covers the territory of America, Europe, north Africa, Middle-East, Byzantine, Mesopotamia, Persia, China and Vietnam. When authors refer to 'Gentle Christ and brutal Church' I am reminded of a booklet I read a few years back, its title, I thought was curious at that time,“Why Indians Like Jesus but not Church”. 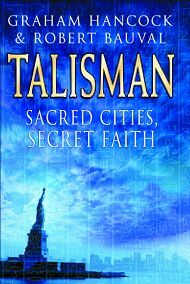 Had I read “Talisman, sacred cities, secret faith” beforehand I would not have felt curious. It stands to reason.